The winner of my first giveaway is Katie from Life In The Fulmer Lane! I'm so excited that she won! She is the cutest girl and she is expecting her first little baby in November! Katie, please contact me at shelleybelley33 @ juno.com so I can send you your Jamba Card! Yum!! Thank you so much to everyone who participated! It was fun to see you guys get excited over this giveaway and I can't wait to do another one! My weekend was pretty uneventful since Michael worked Friday and Saturday night but I have been enjoying my time with Jexibelle! She's the best little dog we could have asked for and we love her so much! I did do a post on Saturday about her getting her stitches out and posted some cute pictures so scroll down if you missed it! On Sunday Michael and I gave talks in church and I'm so glad that's over with! I was really stressing out about it. Public speaking isn't so much my thing!! Michael is really good at it though. Sunday night we finally got around to putting up some more things in our apartment like picture frames and paintings. We also finally organized our closet some more. I think we get better at the whole decorating thing every time we move someplace new! Yesterday Michael and I went my parents community pool with them for a little while to lay out. It was so nice! We were both soaking it up because neither of us get to be outside in the daylight that much since he works at night and sleeps in the day and I have a full time job in an office! It doesn't leave much sun bathing time! After we went to the pool, we went with our friends Kristen and Daniel (who are also expecting their first baby in September!) 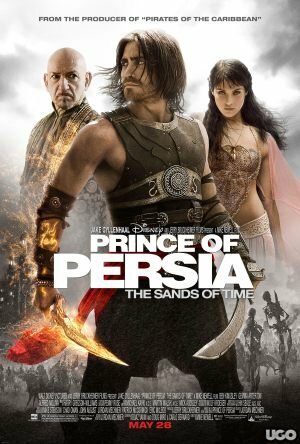 to see the Prince of Persia. I had very low expectations of this movie and I was only going to see it because they wanted to see it with us. I was actually pleasantly surprised!! It wasn't a favorite or anything but it was pretty entertaining in my opinion! My mind is finally at rest too because during the whole movie I kept thinking that Tamina, the female lead played by Gemma Arterton, looked just like the girl from Clash of the Titans (I'm seeing a common theme in the movies we have seen lately...). It's her! After the movie, we went back to our place so Kristen and Daniel could meet our new 'baby'. Jexi loved them, and it was really cute how she snuggled right up to them. I love my friendly little girl! ...And once again I forgot to take pictures, dangit! Congrats to the winner! And sounds like your weekend was great! Ian and I went to our pool too! It was such a nice day yesterday! Ok, you SERIOUSLY have an adorable little pup! What kind is she???? If I read back enough, Im sure I'll find it. Ok, So this is a random question...You sent me a reply to my comment- HOW do you do that?! I'm not new to blogging but I can't figure it out. I am curious about Prince of Persia. Now even more so! Glad you had a nice time with hubby and friends. Shelley, I was dragged to watch Prince of Persia, and I actually liked it! It was really funny too! Woop woop for Katie. Love that lady!